We originally wanted to sail from Ft Lauderdale to Palm Beach, but the wind direction changed while we were delayed one day. Now we had 15-20 knots on our nose. We decided to motor up the ICW instead of sailing. We puttered past the homes of the ultra-rich, waiting for ten drawbridges to raise for us. We anchored in a perfect little circular anchorage just below Delray Beach. Here we met Skip, an interesting character who was anchored nearby. After we were settled in he motored over, gave us all the local sailing news and swapped stories. He had raised seven kids on live-aboard boats. He, his second wife, daughter and poodle were traveling to the Bahamas in their 27- boat. He introduced his lovely daughter as ‘Number Eight’. Skip admired our new life lines, our original teak cockpit table and non-corrosive propane tank. He pointed out some creative uses for all the extra winch we have on our mast. I couldn’t imagine why we had four extra winches. This was a pleasant, relaxing evening after all our initial troubles. 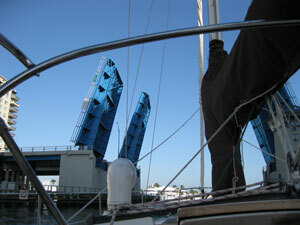 This entry was posted in Florida on the Water, Intracoastal Waterway, Life on the Water. Bookmark the permalink.